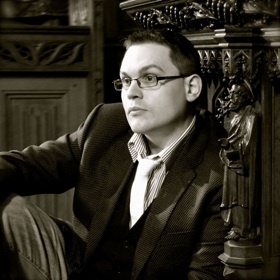 Paul Mealor, Senior Lecturer in Music and Concerts Coordinator at the University of Aberdeen, is Con Anima's principal musical director. He is an accomplished composer whose works, ranging from large, dramatic orchestral scores to small, lyrical choral and vocal miniatures, are increasingly widely performed and heard on radio in and outwith Britain. His music has been commissioned and performed at many festivals around the world by such leading ensembles as the BBC National Orchestra of Wales and the Britten Sinfonia. He is Artistic Director of the Northop Festival of Music (North Wales) and the University of Aberdeen Music Prize (in association with the BBC Scottish Symphony Orchestra). In 2003 he was elected a Fellow of the Royal Society of Arts.